The latest version looks like this. The ROM version of Flashstore allows immediate use of ten functions. These are Select Card, Select RAM Device, Catalogue Card Files, Erase file from Card, Save files to Card, Fetch file from Card, Backup & Restore files to and from RAM, Copy all files to Card, Format File Area and Quit. The bulky mains eraser to format the EPROM is a thing of the past as formatting is done by the Z88 in only ten seconds. Saving and loading files is now over 48 times faster (thanks to Gunther at InterLogic) than the EPROM pack. The speed is 7.7K/second compared 0.16K/second and using the Flash Card feels just like using a floppy disk drive on a PC. This card is the best way of storing your working files on the Z88. 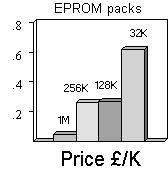 The price /K is a lot lower than the EPROM packs and now you do not need the EPROM eraser any more. Lost files are a thing of the past once a copy is saved in the Flash Card. Is the version that you see on your copy of Flashstore? This was used with the old INTEL chip. Update NOW! The latest ROM version of Flashstore is v1.9.2 (Jan 2011). Unlike ROMs that just had applications on them and EPROMS to store files, Flashstore allows both areas on the same device. The dividing line is determined by the total size of the Applications area in 64K blocks. it is a quick Handy 'Popdown' Application that runs on the Flash Card itself - start it from the INDEX like PipeDream. it allows Applications and files to be stored in the same device. The RESTORE command is used after the Z88's batteries have gone flat. It fetches all the files, creating the directories the files were in (if used) stored on the Flash Card straight to the RAM device. All you need to do is to make sure you have the latest version of your files on the Flash Card. Graphical display showing space used by deleted and saved files, and the free space left. Formatting only erases the file area, leaving Applications intact. Supports multiple Flash Cards. Have your RAM in slot 1 and use two Flash Cards in Slots 2 and 3. Copy all files or individual files, directly from one flash card (or EPROM) to another flash card, without using RAM. Existing users can either use RomUpdate (recommended) to download the latest software from here or we can do it for you. See the next section. This is what the 1st version looked like.